Beefsteak tomatoes are also known as Red Ponderosa or Crimson Cushion. This heirloom variety generally produces very large, ribbed fruit on vigorous vines with high yields. Beefsteak tomatoes can ripen to around 5 inches across and have sweet, meaty flesh. They are great for eating right off of the vine, on sandwiches or in salads, cooking or even canning. Outstanding Features: Very versatile fruit for cooking, canning or enjoying fresh off the vine. 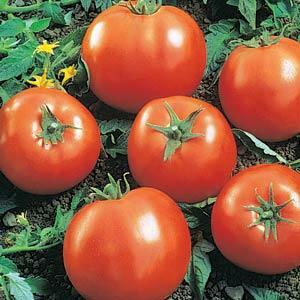 Click here to buy Beefsteak Tomatoes direct from www.buygardenvegetables.com.